“Let Me Google That From Clipboard For You” (lmgtfcfy) is a simple application created in VB.Net. 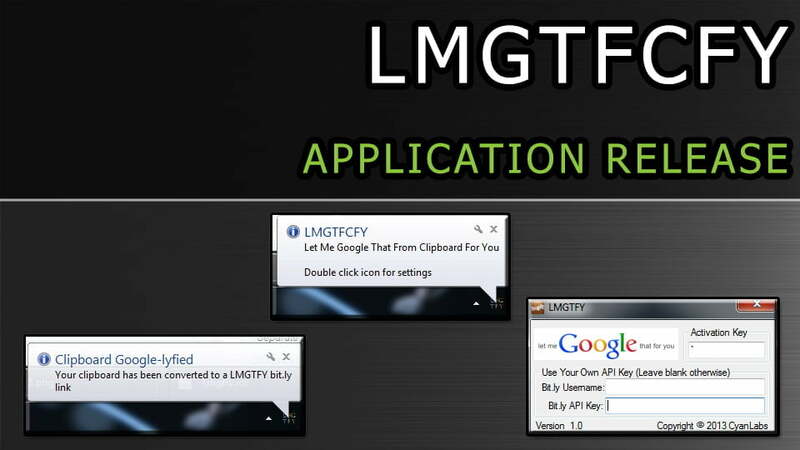 It simply allows you to almost instantly convert your clipboard to a ‘lmgtfy’ (let me google that for you) link. It will then convert that ‘lmgtfy’ link in to a ‘bit.ly’ link *useful for hiding the fact that it is just a lmgtfy link). Simply load the downloaded EXE file and you will notice a small icon appear in your notication area (the right side of the taskbar) from here all you need to do is simply double click the icon. The window shown in the screenshot above will appear, Assign a key to use for converting clipboard contents to ‘lmgtfy’ links and optionally use a custom ‘bit.ly’ username and API Key. Once your all setup simply close this window and copy some text to your clipboard. Final step is to just press the key you assigned earlier. You will now have the ‘bit.ly’ link in your clipboard ready to be pasted to your friend.